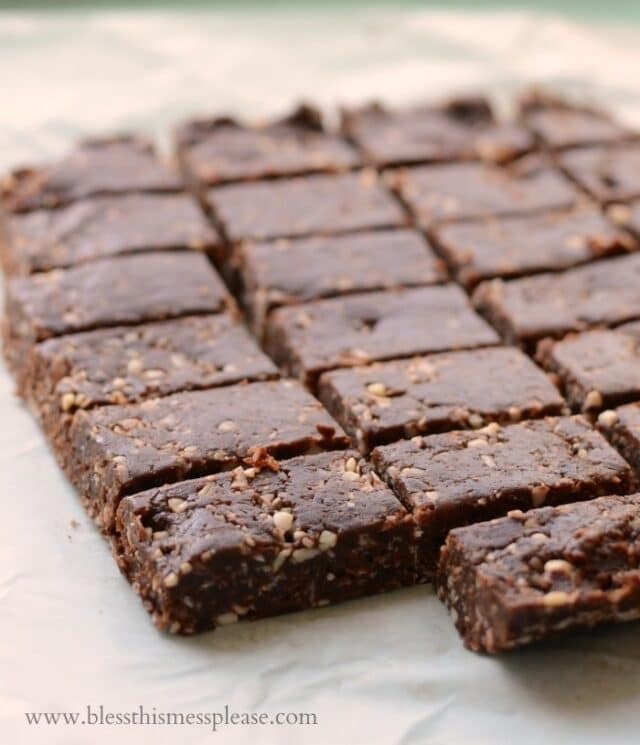 One of our best date recipes are these no bake snack bars! I know you don’t want to spend all day in the kitchen, especially when the weather gets warm! There are plenty of healthy snacks that you don’t need to cook or bake. 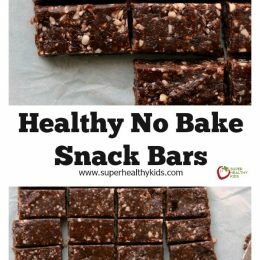 No-bake snacks like a ‘no-bake’ cookie recipe, to regular old dips should be in every parents cookbook. Today we are sharing this nobake date bar. These bars taste a whole lot like a peanut butter cup and my kids love them. You can’t beat how easy, healthy, and simple they are. They also store great! These are a perfect lunch box treat. I also love having them on hand for those times I need a treat terribly but know that I don’t really need a treat. They are perfect craving busters. Dates are a great food to include in your kids day. Not only are the packed with fiber (almost a full gram of fiber per date) they are portable and delicious. Dates are also low in moisture, making them sort of a naturally dehydrated fruit. This makes them easy to take an eat on the go. They are higher in calories than other fruit which is great for picky eaters, as they can pack a log of energy into a small amount of food. That’s what makes these bars an even better snack. With the peanut butter for protein, the dates for fiber, and the cocoa powder and coconut for flavor, kids can eat dates all day long. Because dates are so sweet, dates provide the perfect natural alternative to added sugars in any date recipe. 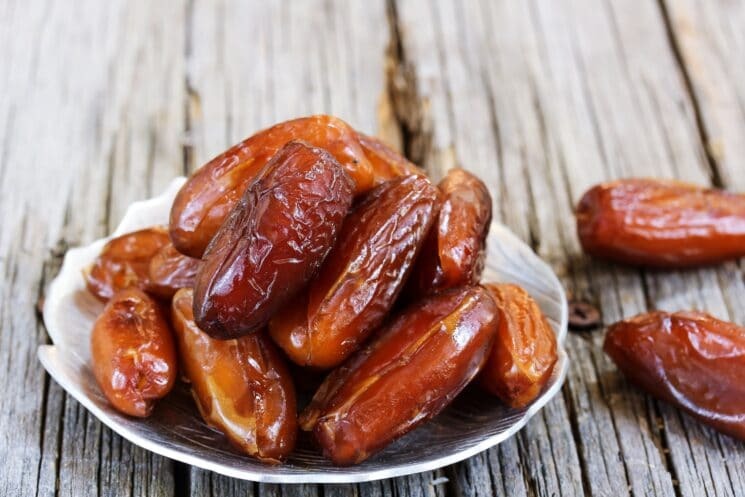 In fact, dates are such a great source of natural sugar, they have been processed to make natural sweeteners such as date juice, date sugar, dehydrated dates, date paste, ground dates, and even diced dates that you can add to recipes you want to sweeten up naturally. Dates have a natural balance of many minerals such as calcium, magnesium, manganese, zinc, copper, iron, selenium and potassium. All of these minerals work in harmony to help lower blood pressure on a daily basis. How to buy and store dates? We like to buy our dates at Costco. You can find them in the produce department in a container with the pits already removed from the dates. We like to look for dates with shiny skin, that isn’t too dried out, because they are easier for the kids to eat, and they can blend in the food processor a lot easier. If you buy dates with the pits in them, you must pop them out before blending in a food processor. You’ll feel or see the long pit (or seed) on the inside if you tear open the date. We store our dates in the pantry or on the counter. Because they are so low in moisture, like dried fruit, dates can last up to 6 months when stored in an airtight container! Although we eat ours much more quickly than this. Can I eat dates every day? You can! One serving of dates is 5-6 dates, which is really easy to do when you blend them in a food processor and make delicious no bake date bars like this! Toss everything into a food processor and process until the mixture starts to go smooth and clump into a ball. The dates will be all chopped up but you’ll still have bits of nut. Turn the mixture out into an 8 or 9 inch square dish lined with parchment paper. Use your hands to firmly press the mixture into the bottom of the dish. Cover and refrigerate for 30 minutes. Remove the bars from the pan and cut into pieces using a sharp knife. Enjoy these bars cold or frozen. Store in an air-tight container in the fridge or freezer. I think a high power blender could be used to make these, but I haven’t tried it myself. A Larabar with chocolate! I’ve had a non-chocolate version of these, and they are not only super yummy, but super easy to make. Can’t wait to add chocolate! They sounded good, but when I made them, they were not very good. I guess not all recipes are for everybody. Thanks for the recipe all the same. Ugh – dates I knew it. I will pass on this one. Thank you- I’ve been looking for something just like this! I have made these without nuts. I just added extra coconut and flax seeds!! You could also use pumpkin seeds or sunflower seeds. If you want to substitute with a different nut, pecans are a similar consistency and a suitable replacement for cashews. I’ve made raw brownies that is a similar recipe and it calls for walnuts. However if you have a nut allergy you could try sunflower seeds maybe. yes, almonds and peanuts work really well. Pecans seem to be a little more oily so don’t use them. PLEASE DO NOT Say that these are a lunchbox treat. They contain nuts. Most schools are nut,free. Awesome! I’m always perplexed, though, how snacks with nuts are listed as being perfect for lunch boxes… who has kids that go to a school that allow peanut/nut products? Shame, as there’s so many healthier treats I’d love to make but much of them can’t go with my kids to school. My kids do. They’re allowed to have nut products for lunch, just not as a classroom snack. my son is allowed nuts. nuts are a healthy snack. My kids do. There is a special table for kids with allergies, and class treats have to be nut-free, but other than that kids can bring what they want in their lunches. In fact, the standard alternative to the cafeteria meal is a PBJ sandwich. Your experience is not universal, and I would imagine that each parent has enough common sense to determine if this (and any other recipe they find on the internet) is suitable for their kids and the school they go to. As it is, I think it is a perfect “lunchbox treat” for my kids. Your mileage may vary. I agree completely! Everything that is easy and no-bake seems to have nuts in them. My daughter is extremely allergic to all nuts. So many of the items on this site, I can’t make for her. You can leave the nuts out and substitute with sunflower seeds. Or a mixture of flax and chia for extra Omegas. You don’t have to add nuts!! I used WOW butter, the peanut butter alternative that is allowed in schools. I left out the cashews and used pumpkin seeds instead. Great! Thanks for the great recipe. My kids have gone to 3 different schools and none have been peanut free. So I think there are a lot of us that could send this recipe to school. Lots of different health concerns out there, no one person could have a recipe that would be perfect for everyone. Looks yummy. Can I skip the cocoa? I’m allergic to chocolate 🙁 any suggestions to substitute? I am also allergic to chocolate. I’ve used Carob as a great substitute in many recipes. Haven’t tried it in this one yet, although I plan to. Good luck! Carob & date is an excellent combination. I make date rolls with carob to satisfy my chocolate beasties since chocolate gives me migraines. I’m sure it would work well in this recipe too. Where do you get this WOW stuff? I don’t know that my son would eat it as he already has developed a mental block against anything that tastes like PB because he has gotten sick on the real thing. So even when I tried sunflower butter, he didn’t want to eat it! I wouldn’t mid trying though! Look great! Nothing odd about dates, they are a great ingredient! Yes you can Michelle- No substitute necessary, just leave it out. What can I use as a substitute for coconut? My daughter is very allergic. Thank you!! Looks great and want to try ti! But what can I use to replace coconut? No one in my family likes coconut, thanks! I have family members that dont like coconut either. What would you suggest to replace the coconut in this recipe? Would desiccated coconut also work (or something else?). I don’t have any shredded. Yes Robyn- that would work as well. Yes, I put oats in mine and they are fantastic. My kids love them and I’m always thrilled to get another serving of whole grains. Actually, lots of people. I personally live in a country where nut allergies are almost unheard of and kids get peanuts and sesame as first foods. ( the current science actually supports this- the earlier allergens are introduced the less likely allergies will develope). Yes I heard this as well, introduce children early to nuts and that will help with kids becoming not allergic. Most schools here as nut free. It makes it very difficult to make lunches. It is frustrating, I can’t understand why everyone has to suffer because of this. The children with the allergy should maybe made to eat their lunch in aseparate area. Can I substitute anything for coconut? Most schools are not ‘nut free’ – PLEASE DO NOT tell someone how to write their own posts. If your kid has nut allergies YOU need to make sure that THEY and THEIR CARETAKERS know how serious it is for them to not come into contact with anyone else’s food. Otherwise YOU are being irresponsible in parenting because sooner or later they will walk out of your bubble and something terrible can happen. As a parent of a child with allergies you can’t act like no one else’s kid can have what your kid is allergic to. And don’t say kids don’t listen-kids that haven’t been taught to listen don’t listen. Helen do you have the recipe? Can I use raisins or sultana’s in this recipe instead of the dates…only because thats all I have on hand atm. They’re a product that’s sold here, they come in lots of different flavours! My kids go to a school where the nut free moto is classroom specific. We so far have never had an issue and take peanut butter every single day. I used dried figs , cutting each in about 6 pieces before processing, and mixed in a Vitamix. They were fantastic, I liked that it has no added sweetner and is high in fiber. Perfect! Yes I agree with and have read up on this too. Apparently you can also reverse nut alleges through very careful addition of minute quantities of nuts over a period of time. Wouldn’t advise this though without consulting the professionals. Can you use cacao instead of cocoa? Or would this change the taste too drastically? Cocoa not so good for you! I used wow butter and added hemp hearts as well as the cashews and it was super yummy. There is also a product called Biscoff that you can get at Wal-Mart that it DELICIOUS and replaced peanut butter for people with peanut allergies. I used raw almond butter and they are awesome!! You could substitute WOW Butter for the peanut butter if it’s available in your area. I have made “peanut butter” cookies with the WOW Butter and they turn out great. Tastes just like real peanut butter only it’s safe to bring to school. My kids go to a nut-free school and it’s a big pain to try to find treats that don’t have nuts. If you don’t have WOW Butter, i’m sure there is another product similiar. Carob powder would work great. These are great! Just made them, and bringing them to my in-laws as an after lunch treat. They are in the freezer (as i need to leave soon!) to cut down on chilling time, but I tasted the dough and they are delicious! I only had one cup of dates, so I added one cup of raisins. I also didn’t have nut butter on hand (and didn’t have time to make some) so instead I put in a banana! I put a little more cacao powder for extra chocolatiness 🙂 I love how this recipe is totally adaptable to individual tastes. I love playing with different ingredients! Maybe one time I’ll stir in some dark chocolate (70% cacao) chips….. Mmmmm! Oh one thing, in case anyone else runs into this problem. Before putting the dates in the food processor, I usually will soak them for 15 minutes in warm water to soften. The ones I buy are usually soft already but I still do this as sometimes my food processor would stop because the dates got up into the blade shaft. I would have to clean it out, then try processing again. Not fun! Should the cocoa be sweetened or unsweetened? I would recommend unsweet because you are using dates. All schools across Canada are NUT Free! I need to substitute the nut butter in the recipe not just the nuts. Any suggestions. Actual suggestions and not the ridiculous debate about schools, thank you. Sunbutter or Wowbutter or just skip the nut butter. I lived in Ontario and now live in Alberta and have never heard that all schools are nut free though. I have 3 school aged kids. Wouldn’t it be by school or school board? This looks fabulous. Could you suggest an alternate ingredient in place of peanut butter and raw cashew? I’m thinking flax seed powder instead of cashew. What could I use instead of peanut butter? Sunflower see paste? Or pumpkin seed paste? I’ve never made pastes of them? Would it work? Try Nutiva Coconut Manna, Artisana Coconut Butter or an avocado. You are just trying to replace the fat in the recipe. Enjoy! We have Never had a nut free school. A few class rooms once or twice have asked to be careful but that is it. The have the allergy table where the kids eat. And if the allergy is bad enough to be air Bourne then the eat in the office. My kids have allergies to almost everything but nuts. So no one is taking that away too. But really if you have an issue with it anything can be subbed out. Sun butter and pumpkin seeds are great. Sunflower butter is a great substitute for peanut butter. And honey plus oats could work well for the dates (or another dried fruit). Made some “energy balls” with similar ingredients and they were gobbled up. Oats, sunflower butter, honey, flax seed, chocolate chips (enjoy life brand is allergen free), coconut, and vanilla. use wow butter if for a nut free school…. it is a not peanut healthy and natural substitution for peanut butter that can be sent to school. Use raisins if you don’t like dates. Lol…I live in Canada and the school my kids go to is NOT nut free. Don’t be spreading lies! Check your facts. My kids take nuts and peanut butter to school. This recipe is fantastic! Don’t be a hatet! Most schools are most certainly NOT nut free hahaha! How ridiculous! Fair enough, I’m in the UK, but I have never ever come across a school which is nut free. Or egg, or shell fish or anything else free for that matter. If a person has an allergy, it is theirs or their care givers responsibility to inform the people who will come into contact with the sufferer, of the allergies. Why would you even say this?? do you know that calorie count of these? Actually, all schools in Canada are NOT nut-free…..why would you think that? “It is very important to note that Ruth King Elementary is not a “peanut-free” school. We believe this would instil a false sense of security and perhaps lessen the focus on careful management of a student with a severe allergy.” School District 62 British Columbia. I followed the recipe to a T, bit after refrigerating, they are crumbly. Should I add more nut butter? Not sure what I did wrong! I don’t think anything Jill- Maybe they just need to come up in temperature just a bit in order to be more pliable. I know Melissa says to eat them cold, but I like them at room temperature, and they always stay sticky. I don’t Sue, but you can calculate it at nutritiondata.self.com. They were crumbly. I decided to add a little water and remix them and that worked! Michelle, You could try soaking them first. Have you ever done that? My granddaughter Veronica is allergic to any type of nuts. What else can I use. Sherry… whenever a recipe calls for nutbutter you can usually substitute a sunflower or soybutter to go nutfree. I don;t know Canadian stores, but in the US, both of those substitutes are usually stocked right on the same shelf as the peanutbutter in the grocery store and are available even at Wal-Mart and places like that. Also, like people said above. If you want some crunch, but not nuts, go for some seeds. Are you suppose to add water or some kind of liquid to help your food processor? Maybe soak the date or something I missed. Mine will not chop these up. I think it’s a pretty nice food processor and I just about burned it up. Any suggestions! Thanks. I believe the dates I bought were just too hard. Just bought from the bulk section at my local grocer. Ok, I think mine must have been too hard. I have never used them before and didn’t realize there would be a possibility of that. My poor food processor is toast. Sounds like a great recipe. Eveline, You can just leave out the coconut. No need to replace it with anything. Just wanted to point out that dates have a TON of sugar (albeit natural)….so if you’re diabetic or concerned about sugar intake, I’d cut back on them to taste. I made these and they were a hit! We loved them, even my picky picky eater:). However, they did not stay together like I thought. They were a little crumbly. Any suggestions? Did I make them too thin maybe? I used almonds and almond butter. Stac- Glad you liked them. Starting with fresher, softer dates might help. The drier they are, the more crumbly it will turn out. Also, making sure you leave it in the food processor long enough to be smooth. Thank you so much for posting these, we love them! The only change we made was adding two tablespoons of unsweetened hemp protein powder. These are a perfect before/after school snack. I can’t stop eating them myself. Now we can stop buying the Pure organic bars since we are trying to avoid agave nectar, brown rice protein, and juice concentrates. These are a great substitute! Could I use raw cacao in this recipe instead of cocoa powder? You can replace it with the powdered raw cacao Laura! These look great! Can’ t wait to make them! Can I freeze them? Niki- I have never tried freezing them,, but I actually don’t think it would be a good idea. Nice, looks like a great take-along for school lunches. My 12yr old son found this recipe while looking for something to make for a school project. He brought it to me and said “mom look at what these people are saying! I feel so bad for the person who shared it.she was trying to share something nice and these people are ruining it!” He said that! And he’s only 12! Now we personally can’t wait to try this! I 100%agree with earlier comment about the complaints over a recipe. If you or someone in your household has unfortunate allergy problems then it’s Your responsibility to search for “____ free” recipes or be wise enough to substitute! How awful to read all this drama over someone sharing a recipe! It’s truly sad!and we wonder why children act the way they do! Doing exactly what they are learning from their example setters! Boy, at this rate I’m glad I don’t have any children anymore! Everyone is so up in arms about a recipe they can readily change to suit their kid’s tastes and needs, but they’d rather scream at others instead of being calm and logical. I tend to wonder who the real children are! This reads like an excellent, healthy recipe, and one that the blogger put time into to make it right and fit for MOST people. She can’t possibly be expected to know what YOUR kid needs, nor what YOUR kid’s school allows or doesn’t. GROW UP, PEOPLE!! I make a version of this, but I first roast cashews, cacao nibs,, and raw shredded coconut in a combination of coconut oil and real butter. I use raw organic peanut butter, and add raw honey to taste. I add as little or as many of the cacao nibs determined by how much chocolate flavor I want. I have considered grinding the cacao nibs and using them that way in the recipe. Mix it all up with my hands, press into small pan and freeze. I can’t leave this stuff alone when I make it. I will have to try adding some raw dates as in this recipe. I bet it adds a nice gooey to the bar. I tried to do these in my blender (I have a Vitamix that’s never been stumped before) and it overheated. Sad. I think the mass of dates is just too much. However, they still turned out delicious! These sound amazing. Is there any reason why I shouldn’t use a mix of nuts (cashews, almonds, pistachios, walnuts)? I’m thinking I should make these before baby #2 arrives in 2-3 weeks and I have all of those nuts mixed together in a big container. Thanks! Definitely worth a try Liza! Hello, the 53g of sugar per serving seem like a lot. Does it all come from the dates? Hi Maria! Thank you for bringing that to our attention! Our system defaulted the servings to only 4. I’ve fixed it, so the grams of sugar per serving should be much lower. I used my vitamix for these and it overheated it! But I managed to get it all blended in two stints after I let it cool down for a bit. They look amazing though! Instead of Cocoa Powder Can a person put chia seeds into “Healthy No Bake Snack Bar Recipe” Or what could you put into it?? DO NOT DO THIS IN VITAMIX!!!!! 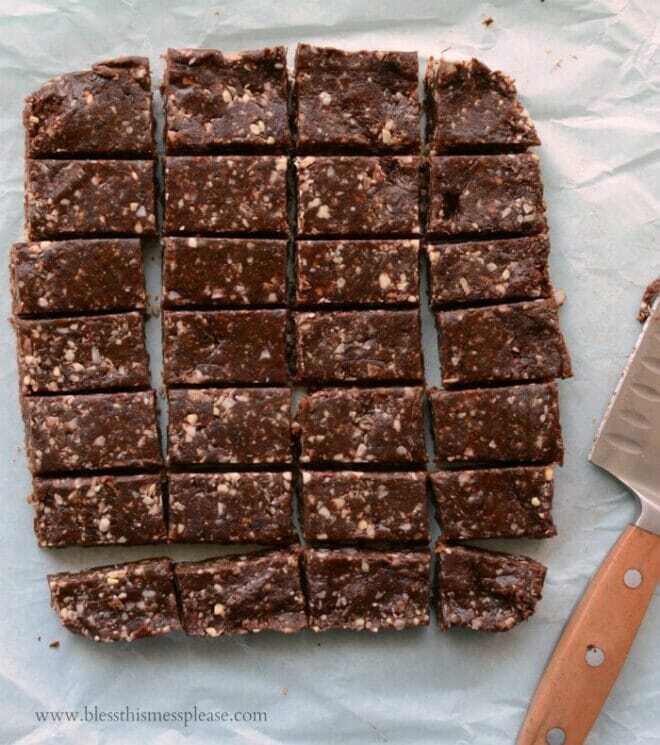 No bake recipe always inspire me and this no bake snack bar is something unique i never had before. This is going to be my weekend snack. Thanks for sharing ingredients. 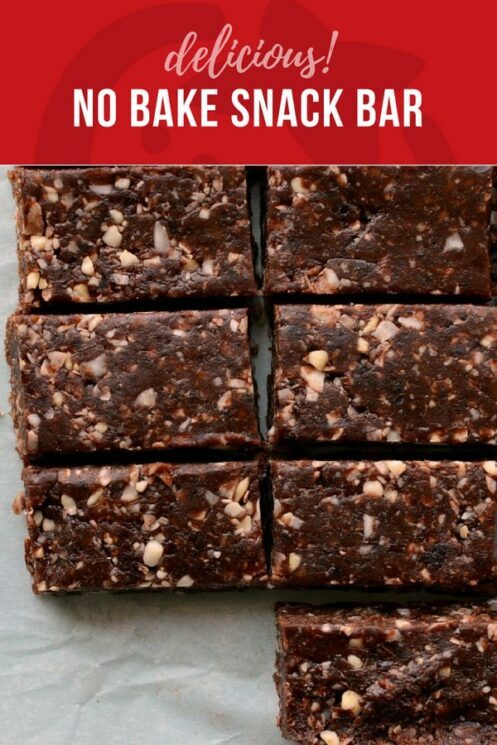 I live in Delhi, India and I tried this recipe and believe me the No Bake Snack Bar were amazing. Will try once again as I have guests coming this weekend. I did not had any idea that we could make a snack bars without baking it. This is so cool! They are delicious! I was leery that they wouldn’t actually taste very good, just be packed with great ingredients. Nope, my kids love them and I love them too. Chewy, chocolatey, peanuty and delicious. Will this work without the nuts ? I absolutely love how you described where to find the dates, how to pick out the dates, and how to store them. I also love that you described how to store the bars. Can’t wait to try the recipe. I’ve made these for my little family and they fall in love with it, my 14 months absolutely loved it. I send some with my husband to work, and I got so many compliments. Thank you for this recipe. A little sweet, so I added a few drizzles of bittersweet chocolate on the top. Giving some away, so will see the response. Hi, we love those bars, they are delicious! do you think I can name small balls with this? Yes you could surely roll into little balls instead of making into bars. Could I use banana instead of the peanut butter? Hi Simone, banana sounds delicious, however I don’t think it would work to bind the bars together. If you wanted to substitute the peanut butter, I recommend another nut or seed butter in its place. I hope this helps! Hi super tasty but did not stick together! Did I not blend long enough??? Hi Colleen, sorry to hear they didn’t stick for you! What type of dates did you use? Medjool dates tend to be very sticky and shouldn’t have any trouble binding these bars together. Deglet noor dates are drier, and might not bind as well. If you’re using deglet noor dates, you could try adding a teaspoon of water to moisten them. I just made these according to recipe and added a little banana to bind. It worked & they were delicious ?